MANILA, Philippines – The January 2019 edition of Webometrics Ranking of World Universities is out! University of the Philippines - Diliman (UPD) is still the country's no. 1 university based on web presence, impact, openness and excellence, the Spanish National Research Council’s Webometrics has reported. UPD ranked 1,216 or up by 145 spots compared to same period last year out of more than 20,000 Higher Education Institutions (HEI) worldwide. 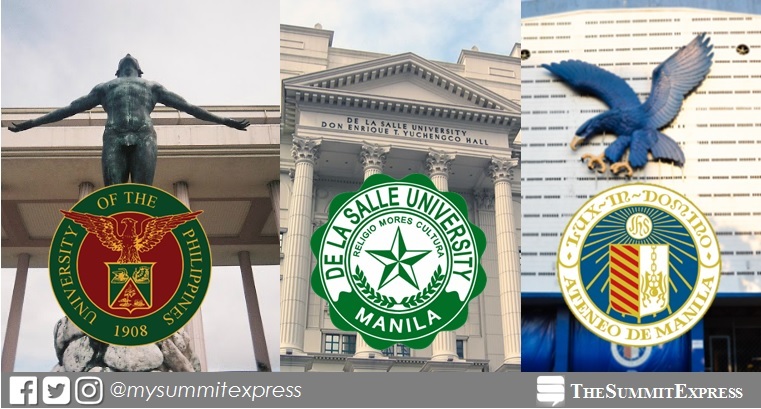 De La Salle University (DLSU) - Manila came in second place with 1,849 world rank, up by 2 notches. Ateneo de Manila University ranked third, 2,383 or up by 515. Constituent universities (CU) of UP such as University of the Philippines Manila (4th), University of the Philippines System (5th), University of the Philippines Los Baños (6th), University of the Philippines Mindanao (13th), University of the Philippines in the Visayas (19th) and University of the Philippines Open University (21) are included in the list. Completing the top 10 schools are University of Santo Tomas, University of San Carlos, Mapua Institute of Technology and Silliman University. According to its website, the "Webometrics Ranking of World Universities" is an initiative of the Cybermetrics Lab, a research group belonging to the Consejo Superior de Investigaciones Científicas (CSIC), the largest public research body in Spain. "The ranking is not only focused on research results but also in other indicators which may reflect better the global quality of the scholar and research institutions worldwide," Cybermetrics Lab added. In the current edition, indicators were obtained during the month in order to maintain the freshness of the data of the most current and updated Ranking of Universities.